Quite a few years ago, I used to make a wonderful apple crumble. We were so obsessed with it, that for a while, I think I must have made it at least every two weeks. It was easy, fast, cheap and tasted unbelievable. The perfect dessert or cake substitute on a lazy Sunday afternoon. After eating it about a million times, we kind of got tired of it, so I didn’t make it for many years. Then I remembered it and started making it again for once in a while. 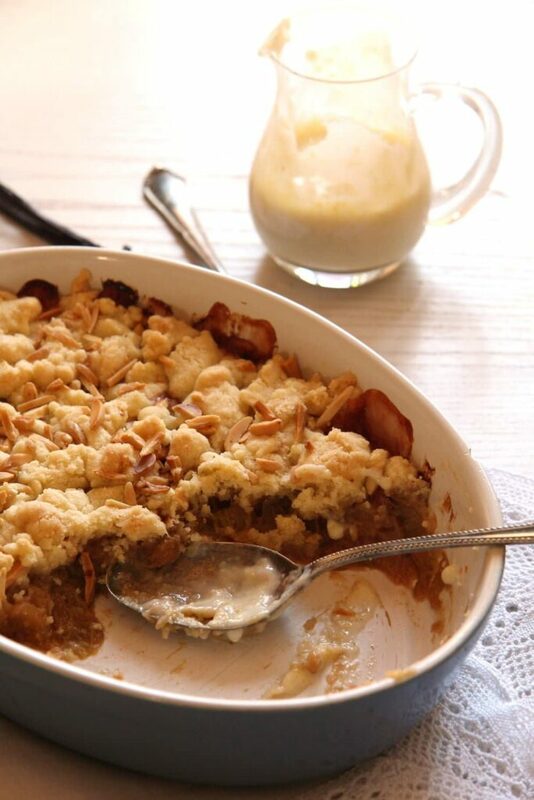 This rhubarb crumble recipe is a variation of that famous and simple apple crumble. I made it for the first time last year and we loved it soooo much, that I started making this more regularly than the plain apple crumble. 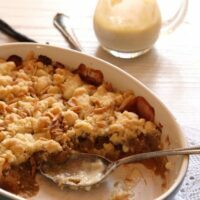 I always have some frozen rhubarb in my freezer, so it’s not a big deal, I can make the apple rhubarb crumble in winter or autumn as often as I make it in spring. Rhubarb crisp is also a favorite in our house, sometimes I make this rhubarb crumble recipe, sometimes I make the rhubarb crips. But what is the difference between a crumble and crisp? 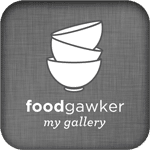 Well, they are more or less the same dish, a hot dessert baked in a casserole dish, which can be made with different sorts of fruit or berries. A crumble has a topping made with flour, sugar and butter while a crisp’s topping also contains oats. And speaking about frozen rhubarb, did you know that rhubarb freezes very well? This way you can enjoy rhubarb anytime you want and not only in spring. Wash and chop the rhubarb, place it in freezer bags and freeze it. It will keep for at least one year, I always use up the last couple of bags a few weeks before the fresh rhubarb starts to grow again in the garden. Any of the rhubarb recipes I posted until now and will be posting during the next week can be made with either fresh or frozen rhubarb. Once defrosted the rhubarb tends to release a bit more water than usual, if you don’t need the extra liquid in the recipe, just place the rhubarb in a sieve and drain shortly. For jams or rhubarb butter I would use fresh though, you need a lot for this purpose, so it’s only worth it when you have lots of rhubarb. 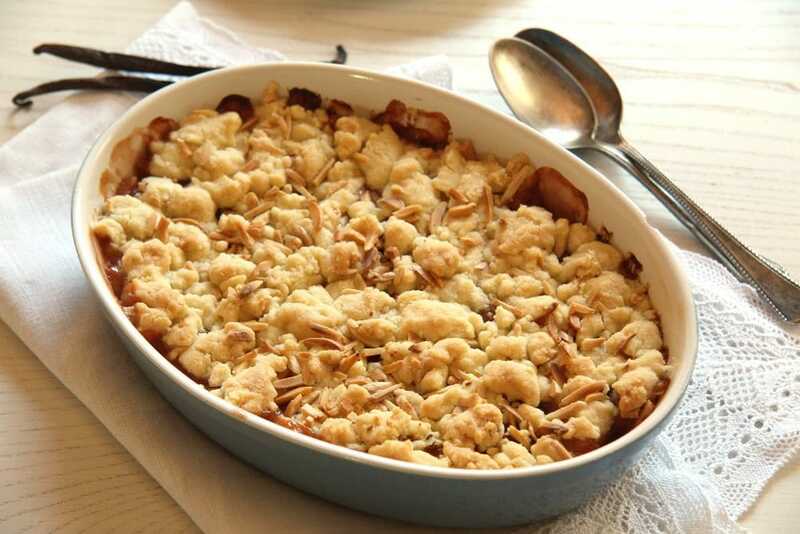 If it’s your first time with rhubarb or are afraid rhubarb might not be your thing, please try this rhubarb crumble recipe! You will love it! The tartness of the rhubarb is wonderfully balanced by the apples and the sweet crumble and serving this with custard, vanilla sauce or vanilla ice cream will only make things better. Don’t be afraid of it being too sour, it isn’t, it is just perfect. I like it best still warm, but I’m never saying no to a bowl of cold rhubarb apple crumble either. Clean the rhubarb and chop into slices, about 1,5 cm/ 0.6 inch thick. Peel the apples, remove the core and chop the apples into chunks. Melt the butter in a pan and saute the rhubarb and the apples for a couple of minutes. Add the cinnamon and the honey and continue cooking until all the liquid has evaporated, it won't take long. The apple chunks will remain more or less whole, while the rhubarb will almost disintegrate and form a kind of sauce for the apples. Taste and adjust the taste with a little bit more honey, if necessary. Don't make it too sweet, remember that the crumble is sweet and you will serve this with more sweet stuff. Pour the mixture in a medium casserole form. Toast the almond slivers in a small pan without adding any fat. Keep and eye on them and shake the pan regularly. Transfer to a plate as soon as they start to get golden and fragrant. Place the flour and the chopped butter in a bowl. Rub with your fingers until you obtain crumbs. Add the sugar and about 2/3 of the almonds and mix together. 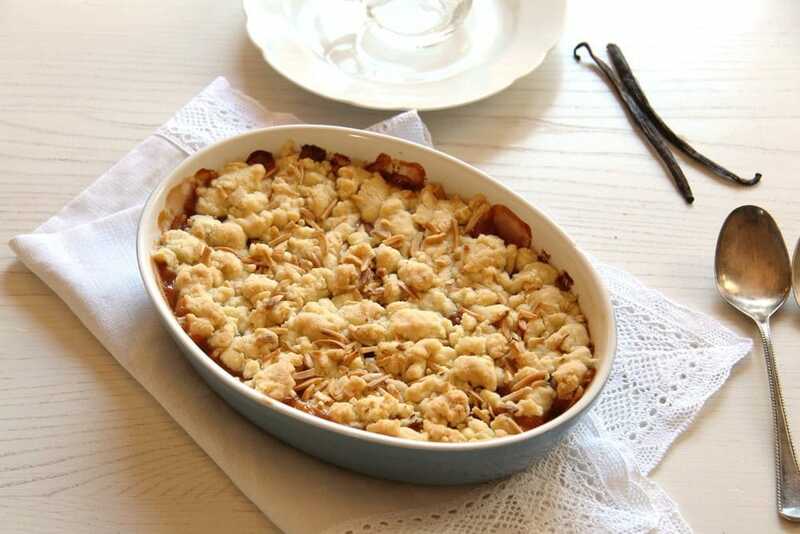 Distribute the crumble evenly over the rhubarb-apple mixture in the casserole form. Sprinkle with the remaining almond slivers and bake for about 20 minutes or until the crumble is golden brown. Serve hot, warm or cold with custard or vanilla sauce or vanilla ice cream. The vanilla ice cream is particularly good when the crumble is still hot or warm. Rhubarb is one of my favorites. I love the tartness but I also love that it is ready in the early spring! There’s nothing better than having something fresh from the garden. This crumble sounds delicious! Such a great idea adding almond on top! I have no idea how to choose which of your rhubarb recipes to make first each one looks sooo delicious! 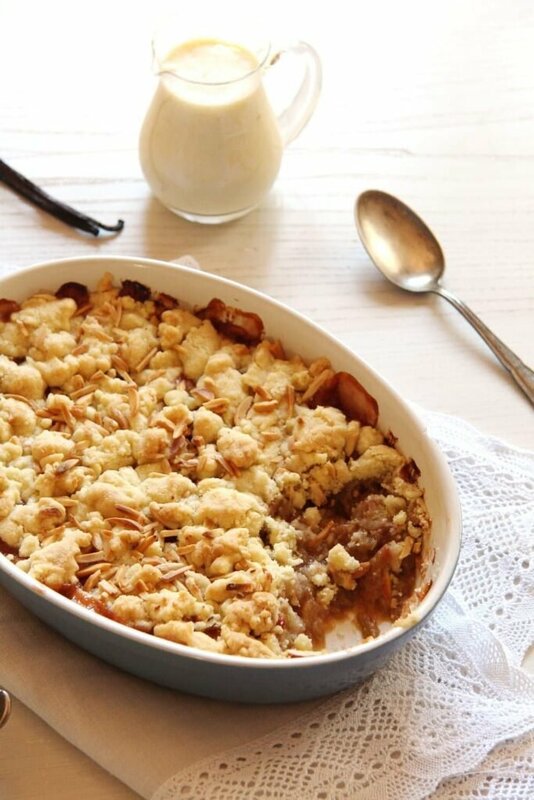 What a fun twist on an apple crumble and I love the almond crumble topping. Now that I know I can freeze rhubarb I’m going to make this for our next Christmas potluck! Crumbles are my absolute favorite desserts! Warm with ice cream they’re just heavenly! Can’t wait to try this one. How much is a knob of butter? I have bags and bags of frozen rhubarb and bags of apples, gift from the neighbor that has a tree full of apples. This would be perfect to use up this fruit. Hi Cheryl. A knob of butter is about as large as the upper part of your thumb, a bit more or less doesn’t really matter. I hope you like the crumble. ?